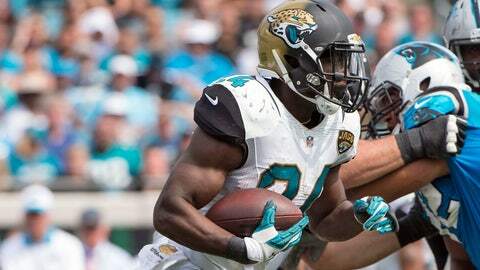 Jacksonville Jaguars rookie RB T.J. Yeldon has rushed for 291 yards on 81 carries this season. JACKSONVILLE, Fla. (AP) — Jacksonville Jaguars running back T.J. Yeldon returned to practice Thursday, an indication he might be able to play against Buffalo on Sunday. Yeldon missed four consecutive practices with a groin injury and sat out last week’s loss to Houston. Without him, Toby Gerhart and Denard Robinson combined for 45 yards on 16 carries. Yeldon has 291 yards rushing, 73 yards receiving and a touchdown this season. Receiver Allen Hurns (ankle/thigh) and safety Johnathan Cyprien (calf) also returned to practice after sitting out Wednesday. Right tackle Jermey Parnell (knee), receiver Marqise Lee (hamstring), safety James Sample (shoulder) and tight end Clay Harbor (abdomen) missed practice Thursday. Lee and Sample are unlikely to play against the Bills in London.